The goal of TEP's Habitat Enhancement Program is to develop, prioritize, and implement on-the-ground projects that address the critical problems of habitat loss, water quality degradation, sedimentation, and impaired floodplain function. TEP staff develops and manages projects, and provides funding and administrative support to partner projects. Some projects are multi-faceted and therefore, overlap project types. Projects are listed under the project type that most closely describes the primary enhancement component. This project replaced an undersized and failing culvert (4.5 ft circular metal pipe) located approximately 150 ft upstream of Mapes Creek's confluence with the Kilchis River (where Kilchis River Road crosses Mapes Creek) with a 32 ft concrete bridge . The new bridge included driven H-piles; cast-in-place pile caps, abutment walls, wing walls and impact panels; and pre-cast, pre-stressed bridge panels. It also included reconstruction of approximately 100 ft of stream bed following stream simulation guidelines. The new bridge is ~1.5 times as wide as the Mapes Creek's active channel and the constructed streambed matched the gradient and substrate of the natural streambed upstream of the crossing. As a result, the new bridge will provide unimpeded passage for a variety of aquatic organisms including the federally threatened Oregon Coast coho salmon. It also will improve stream function by reducing potential for downstream erosion and allowing for proper sediment and nutrient transport. Further, the new structure meets current seismic safety standards and will not be prone to plugging with woody debris and streambed materials like the culvert it replaced. This will greatly improve public safety by reducing potential for failure during earthquakes or high flow events and it also will greatly reduce maintenance time and expenses for the Tillamook County Public Works Dept. The new bridge will be on the National Bridge Inventory System and subject to Oregon Dept. of Transportation bi-annual inspections. In addition, the County's maintenance crews will no longer have to regularly remove debris from the inlet of this structure (like they did for the culvert that was replaced). This Kilchis Basin in an important watershed for salmonid conservation on Oregon's north coast. It has been designated as Salmon Anchor Habitat by the Oregon Dept. of Forestry (ODF) and the Wild Salmon Center. A summary of watershed health indicators for the Oregon Coast Coho ESU completed for OWEB (Bauer, et.al, 2007) concluded that passage barriers were a Moderate Limiting Factor for coho salmon recovery in the basin. A considerable amount of conservation work has been completed in the watershed, including an approximately 60-acre tidal wetland restoration project located about 3.5 miles downstream of this project location. Bailey (2012) identified 10 High-Priority barrier culverts on tributaries in the Kilchis Basin. This project removes one of the most significant barriers in the watershed. 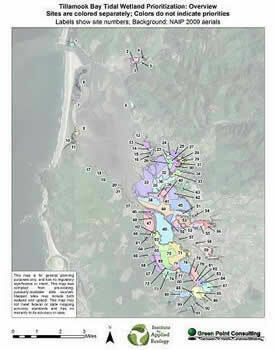 The East Beaver Creek project is the product of a private-public partnership among the land owner (Stimson Lumber), theTillamook Estuaries Partnership, Tillamook County, ODFW, BLM, and USFS and aims to address three primary habitat problems: 1) instream habitat has been simplified (i.e. few pools, side channels, poor gravel sorting and deficient large woody debris); 2) some sections of East Beaver Creek Road were constructed too close to the stream, reducing its ability to meander naturally; and 3) the riparian area is deficient especially in conifers. 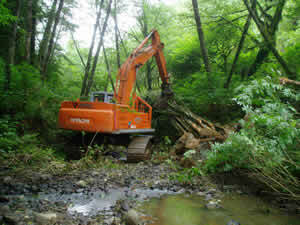 To address the above habitat problems the following work was implemented: (1) the placement of five large woody debris structures and 10 scattered individual trees; (2) moving approximately 800 linear feet of roadway away from the stream; and (3) planting 1,285 riparian trees and shrubs within the riparian corridor. This project is incredibly important in that East Beaver Creek, a tributary to the main stem Nestucca River, is one of the primary producers among all of the Nestucca’s tributaries as noted by ODFW spawning inventories and the salmonid species present: Fall Chinook, Oregon Coast Coho, Winter Steelhead, and Coastal Cutthroat Trout. These reports were completed for Phase 1 of what is anticipated to be a three phase effort. Jackson Creek, a small, direct-to-ocean tributary in Cape Lookout State Park was adversely affected by a 1950 project that diverted flows from its historical, ocean-going channel into Netarts Bay. In addition, a concrete-reinforced ford crossing in the ocean-going channel impeded fish passage and adversely affected the channel. This project filled the diversion channel to restore historical banks, reconnect the floodplain and return full flow to the ocean-going channel. In addition, the project removed the ford crossing and a wooden pedestrian bridge. 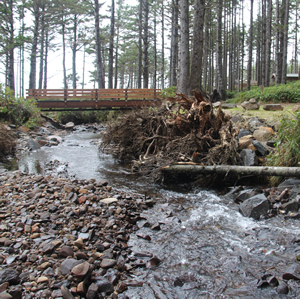 The channel in this area was re-constructed to provide unimpeded fish passage and improve in-stream conditions and a new all-purpose, timber bridge was installed. The intake to the park’s water treatment system also was upgraded to facilitate implementation of the aforementioned actions. This project was funded by the Oregon Watershed Enhancement Board, U.S. Fish & Wildlife Service, and Oregon Parks and Recreation Department. We contracted with Green Point Consulting (GPC) to identify, characterize, and asses tidal wetlands in the Tillamook Bay Watershed, and prioritize these sites for restoration and conservation. This effort facilitates a strategic approach to protecting, restoring/enhancing, and managing tidal wetlands in the estuary; provides for more efficient use of funds and other resources; and allows TEP and our partners to focus conservation action towards areas and activities that will provide the most benefit for wildlife and their habitats. 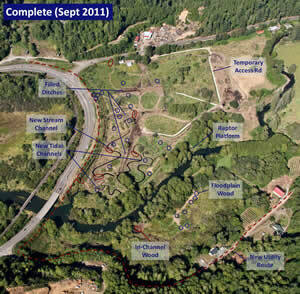 This project was supported by grants of funds from The Wild Salmon Center, U.S. Environmental Protection Agency, U.S. Fish & Wildlife Service, and Pacific Coast Joint Venture/Ducks Unlimited. 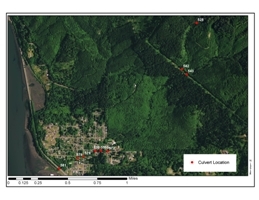 We hired six student interns and completed field surveys of nearly 900 road-stream crossings throughout the Tillamook Bay Watershed that were identified using a computer-assisted analysis. Through this effort we identified 215 culverts within the watershed with potential to affect fish passage. We gathered detailed information on these 215 culverts and prioritized them for replacement based on the degree to which they impaired fish passage, quantity and quality of upstream habitats, and the species of fish affected. This project was completed to facilitate a strategic approach to passage barrier culvert replacement; improve inter-organizational, long-range planning efforts; and allow for more efficient use of funds and other resources. Our efforts are paying off. Some culverts identified and prioritized in this study have already been replaced by our partners and we are moving forward with several replacement projects at this time. 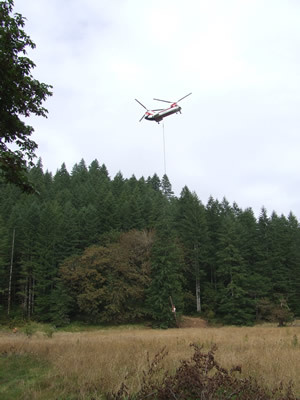 This project was supported by grants of funds from the National Fish & Wildlife Foundation, Oregon Governors Fund; Tillamook County; U.S. Environmental Protection Agency, and The Norcross Wildlife Foundation, Inc.. 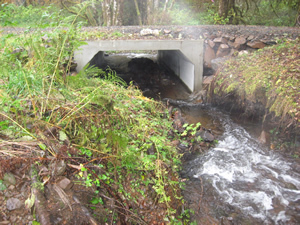 This project, funded by the Bureau of Land Management and the Oregon Watershed Enhancement Board, replaced two passage barrier culverts on Fan Creek, a tributary in the upper Nestucca River watershed. Together, these culverts impeded passage to approximately 1.2 miles of spawning and rearing habitat and impaired stream habitats and functions. The new culverts, designed to pass 100-year flood waters and associated bed load and meet fish passage requirements, are open-bottomed structures that include constructed stream beds that simulate the natural substrate. Funding for this project was provided by the U.S. Bureau of Land Management and Oregon Watershed Enhancement Board. Fawcett Creek is an eastern tributary to the Tillamook River, which drains into the Tillamook Bay. Two miles upstream of Fawcett Creek’s confluence, at the transition from rural residential/agricultural land use to forestry, the City of Tillamook operates an antiquated surface water diversion as a primary source for the municipal water supply. The diversion dam blocked fish passage to important habitats and the lack of a screened diversion led fish to become trapped in the settling pond. The God's Valley Creek sub-basin drains 5,100 acres in the North Fork Nehalem River Watershed on Oregon's North Coast. God's Valley Creek is one of the top producers of coho salmon in the Nehalem Bay watershed and is considered a core area by the Oregon Department of Fish and Wildlife. God's Valley Road meanders through the valley bottom, crossing over 14 tributaries that drain into God's Valley Creek. Collaborating with four partners, TEP led this project that addressed a 3.5-mile section of poorly designed God’s Valley Road where high water velocities, culvert plugging, stream overtopping, and road erosion contributed to fish passage barriers and sediment run-off. To remedy these concerns on the God's Valley Creek tributaries, TEP replaced six culverts with new structures that are installed at the stream’s gradient and meet or exceed the stream's active channel width. 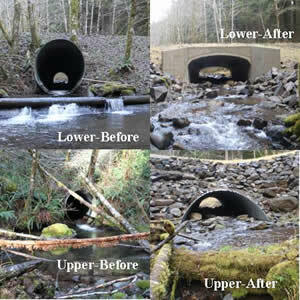 Collectively, the culvert replacements restored passage to 2.56 miles of salmonid habitat and are improving water quality. In 1980, the Neskowin Regional Water District (NRWD) constructed a rock weir impoundment on Hawk Creek, a tributary to Neskowin Creek in south Tillamook County, to meet water diversion demand at their new water treatment plant. 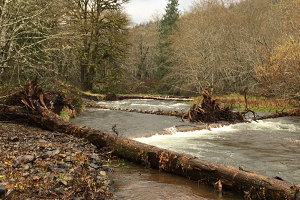 The rock weir impeded adult salmon and blocked juvenile fish passage to 1.5 miles of spawning and rearing habitat. 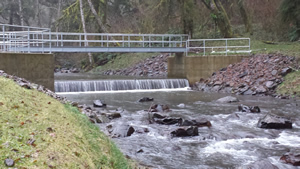 In the interest of improving conditions for salmonids in the Hawk Creek Watershed, the NRWD elected to voluntarily upgrade their Hawk Creek water diversion facility to address Oregon Department of Fish and Wildlife’s fish passage criteria. The purpose of this project was to improve fish passage beyond the water impoundment and municipal water intake structure. 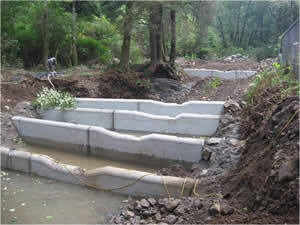 This project installed a 170 foot long full-spanning fishway comprised of 16 notched concrete sills. Large wood and boulders were also incorporated. The new fishway design allows adult and juvenile salmonid passage throughout the year while meeting the NRWD’s water intake demand. Coal Creek has over two mainstem miles of salmon spawning and rearing habitat. The creek flows through second growth and mature timber, owned by Tillamook County, before reaching private agricultural land and emptying into the Kilchis River in the Tillamook Bay Watershed. A 30-foot high fish passage barrier dam, degraded instream salmon spawning and rearing habitat, an abandoned waterline in the riparian area, drainage culverts, and lack of riparian vegetation all contributed to degraded watershed conditions. In a two year construction period the dam was demolished, log and boulder structures placed throughout 1,000 feet, three drainage culverts removed, and the edges of the old reservoir stabilized with native vegetation. These activities help restore fish passage and stream processes, facilitate gravel retention, stabilize the channel gradient, and improve channel complexity. In 2007 TEP and 16 other partners enhanced Wolfe Creek’s salmon spawning and rearing habitats, restored fish access into the watershed, and re-established vegetation in riparian areas. The primary project goal was to increase coho, fall chinook, winter steelhead, and cutthroat populations in Wolfe Creek. Wolfe Creek meanders through US Forest Service and private agricultural land before emptying into the Nestucca River, just east of Beaver. 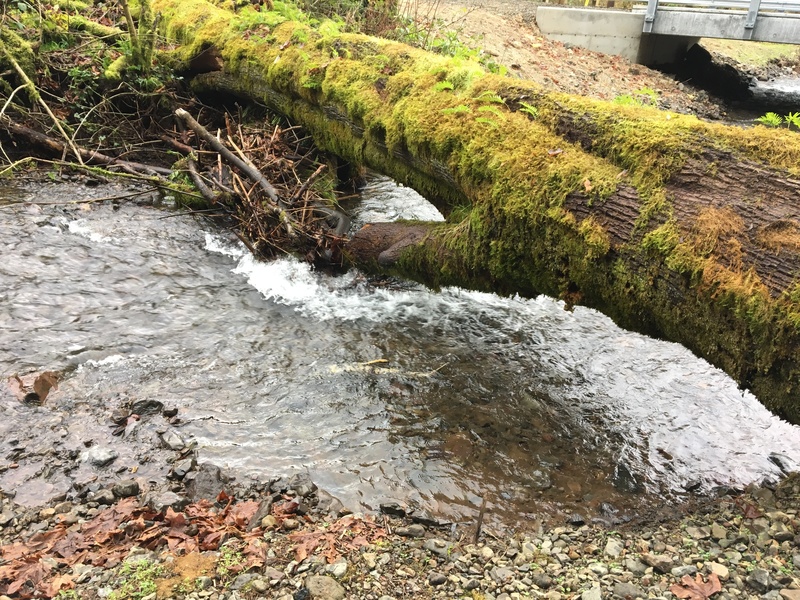 First, to address the lack of quality salmon habitats, TEP contracted with excavator and helicopter contractors to meticulously place 258 logs in natural configurations throughout nearly two miles of the creek. Second, being the only culvert on Wolfe Creek, a new bottomless arch culvert provides salmon passage to three miles of upstream habitats. Finally, TEP hired local contractors to plant 800 native trees and shrubs, and install livestock fencing and off-channel watering stations. The project represents an extraordinary opportunity, where partners used several restoration techniques to enhance a watershed and strengthen local, regional, and national partnerships. In 2004, the Oregon Department of Forestry (ODF) and Bureau of Land Management (BLM) began discussing opportunities to collaborate on habitat enhancement within the Elkhorn drainage. Straddling ODF and BLM land, the Elkhorn Watershed lies within the Trask River Watershed, one of the five major sub-basins in the Tillamook Bay Watershed. The first such collaborative effort within the region, the project offered a unique opportunity to leverage the efforts of state and federal landowners towards common restoration goals. TEP managed the $190,000 project on behalf of nine partners. During the summer of 204, TEP replaced two fish barrier culverts and enhanced over one half mile of riparian areas. 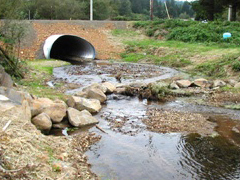 Located on Smith Creek, a tributary of the Nestucca River on Oregon's northern coast, the two new culverts restored access to 1.5 miles of native salmon spawning and rearing habitat in the Siuslaw National Forest, restored sediment routing processes throughout Smith's lower reaches, and dramatically decreased non-point source bacterial loads entering the creek. 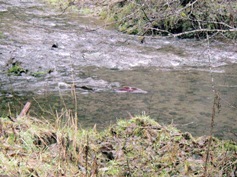 Killam Creek, a tributary of the Tillamook River, provides habitat for federally-listed threatened coastal coho salmon, and depressed populations of chinook salmon, chum salmon, steelhead trout, and resident and sea-run cutthroat trout. 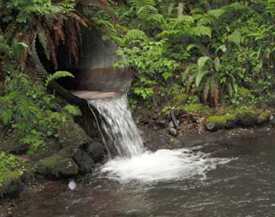 The City of Tillamook has used Killam Creek as one of its two main drinking water surface sources since the 1920's. The design of the water diversion dam prevented upstream passage of adult anadromous fish under most flow conditions, however, and posed a complete fish passage barrier to juvenile fish. The barrier prevented fish access to 3.8 miles of mainstem habitat and 2 miles of tributary habitat. In addition, the existing diversion lacked a fish screening device, which often routed juveniles into a settling pond. 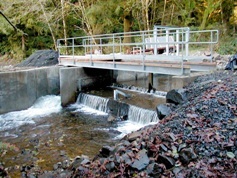 In 2004, the City of Tillamook partnered with TEP to construct a fish ladder to divert salmon around the diversion dam and intake screens.